Big frontage to main road flat land no import of clay require for developement water and elect. 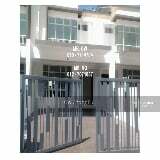 Property Type: 4 Storey Shop. Property Features: Freehold. International Lot. Loca. Double Storey Shop House for Sale. Jalan Indah, Taman Medan Indah, 81900 Kota Tinggi, Johor.